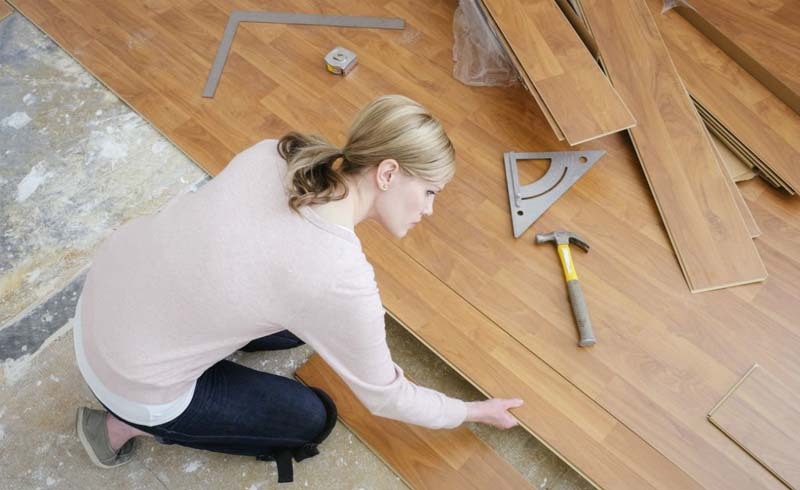 Find out how new and improved, hard-working laminate flooring stacks up to the competition. First introduced in the 1970s, laminate flooring is comprised of layers of synthetic material engineered to look like wood or stone. It quickly became a popular choice due to its durability and low price, garnering a reputation as an affordable alternative to the real thing. Today’s laminate has come a long way since it first hit the market, and its quality and appearance continues to improve, with more options than ever available now. To find out if this material is right for your budget, lifestyle, and aesthetic preferences, first consider these pros and cons of laminate flooring. There’s an option for virtually every style. 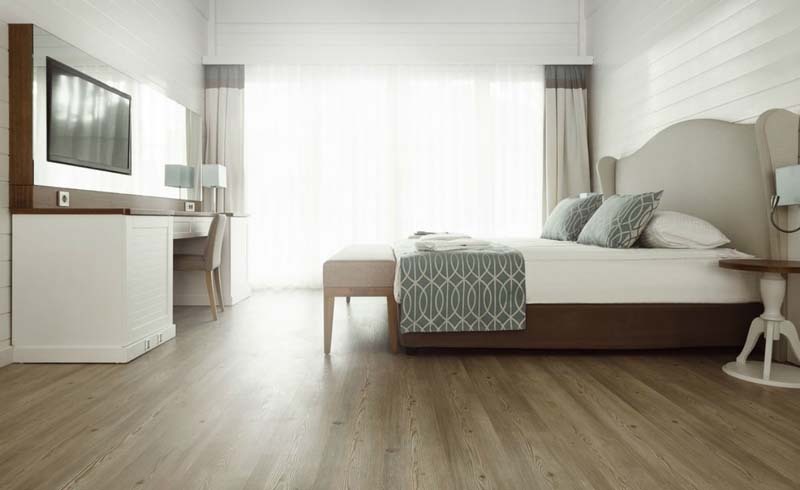 All laminate flooring has a core layer topped by an image layer, into which a digitally enhanced photo of a natural material is embedded to mimic everything from exotic hardwoods to concrete to natural stone—a major pro. It comes in a variety of colors, lengths, and widths and, these days, texture can even be embossed to give the flooring a more realistic feel. Still, some critics insist that no matter how high-end the product, laminate simply can’t compare with the natural beauty of real wood or stone. Laminate flooring can run about half the price of wood flooring but, as with wood, you’ll find a range of varying quality. Some look more realistic than others, and some are less substantial in the thickness of the different layers, making them more likely to wear out sooner than a higher-quality product. You’ll typically find laminate options starting at less than $1 per square foot and topping out around $5 per square foot. …but you can’t refinish it. Despite technological advancements in laminate flooring, it still gets its look solely from the image layer, which can’t be sanded and refinished when it starts getting worn. Wood, of course, can be revived multiple times over its lifetime, with the potential to last decades. So while the upfront price might be right for laminate, know that in the long run, wood might be a better buy. In addition, wood offers a higher return on investment in terms of your home’s resale value. Laminate has varying degrees of durability and resilience. Knowing that laminate can’t be refinished naturally makes you wonder how long it lasts. Fortunately, there’s a highly durable wear layer above the image layer designed to withstand foot traffic, sun fading, scratches, dents, and stains. And if a piece does get damaged, you can often replace the individual plank. But in case you can’t pull up the unsightly plank, repairing a scratch or dent in laminate flooring can be tricky at best and impossible at worst. Laminate is easy-care—with some caveats. Excess water can cause laminate flooring to warp or stain, so aside from sweeping and vacuuming as needed, it should be cleaned carefully, generally with plain water. Use a flat mop and wring out the water before each pass. For tougher cleaning jobs, use a commercial laminate cleaner. An acetone-based solution (like nail polish remover) can help tackle tough stains. Laminate is popular with DIYers because it can be installed fairly easily atop structurally sound subfloors. There’s no glue involved, as laminate planks aren’t adhered to the floor. Rather, the laminate rests atop the necessary underlayment and connects to adjacent pieces using snap-and-lock or tongue-and-groove joinery. A room can be done in a weekend by a moderately handy homeowner. But be wary: One of the biggest issues during installation is damaging the edges of planks, making them more susceptible to water seepage. … but read your warranty carefully. In order to be fully covered by your laminate manufacturer’s warranty, professional installation may be required. Review the terms of your product’s warranty prior to purchase if you’re planning to DIY the job.